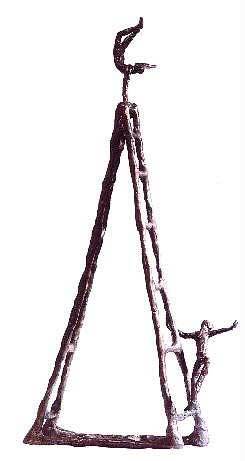 my sculptures during the years 1991-1997.
became a life-death issue in my work. while sitting in my studio rocking chair. the motivating spirit as both often moved in opposite directions. Can the spirit defy the body and rise to greater heights as if it is immortal? Working in wax is my old-age material. for brilliant images in durable bronze. 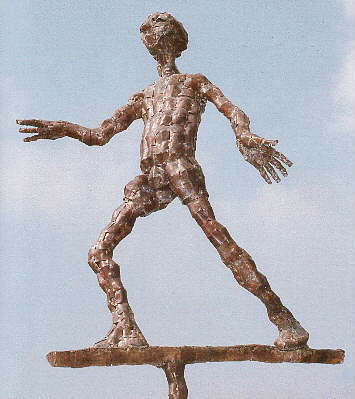 "The Ladder" Bronze 1992, h. 46 cm. 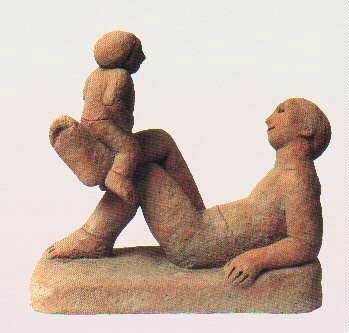 "Tad and Son" 1995, terra-cotta, h. 41.5 cm. like a breath of life. 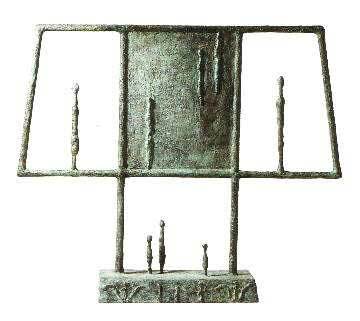 "Echoes of the Past III" 1992-3, bronze, h. 97 cm. yet in the stillness there is peace. echoes of the past resound. 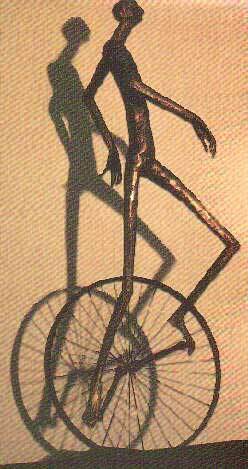 "Unicycle" 1975, Welded brass, bicycle parts. h. 185 cm. Coll. Dr. Marilyn Safir, Haifa. The figure has for me endless expressive possibilities. Sometimes my concept of the figure is so vivid that it dictates clearly what l must do. At other times my image changes as working realities alter my vision. Then, acknowledging the unique vitality of the sculptural material itself, l move along in company with it to try to find a finality, a sculptured home for the feeling inherent in the concept. In rendering my concept, I often rearrange my own physical positions so as to find the bodily counterpart of the emotion. I look for combinations from all the marvelous variations of movement and form relationships. Letting my body drop into a feeling of the moment, l explore my body arrangement  a hand touching, the fingers spreading, the head turning, the toes curling. My sculptural concepts are spaded out from the inside of myself, and look for a translation of them. At times, my feelings are too complicated and it becomes necessary to simplify them and yet maintain their original force. The existence of the finished work embodies my final choices from the whole world at my disposal. "Night Runner" 1981. Welded copper, 167x180 cm. 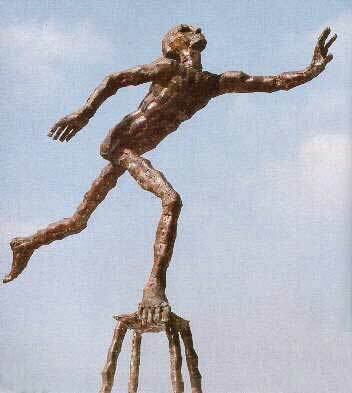 "Balance Act" 1981. Welded copper, 196x95x58 cm. 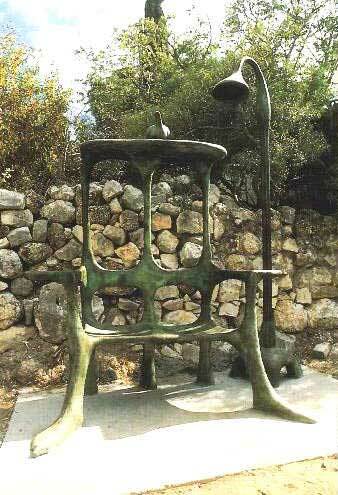 "The Surreal Peace Chair" 15.7.1995. Bronze. 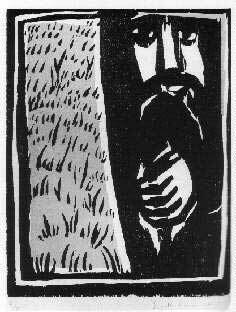 h. 320 cm. Ein Hod Village Entrance. E-mail For information, more art work or purchasing. Born in Lakewood, Ohio. Youngest of three daughters, born to Ella and Benjamin Schochen who emigrated from Russia to Cleveland in 1905. Henry Moore and Jacob Epstein. Graduate studies at Hunter College, New York. Produces educational film: Bronze Welding in Art with Dorothy Robbins. Center for Instructional Resources, New York State University College, New Paltz. Visits Israel for the first time. Meets sculptor Itzhak Danzinger. Art Department, University of Haifa. Book of Poetry: "Beats from Heartland"
12.12.1999 Died in Ein Hod. Past Places Revisited, Mishkan LeOmanut, Museum of Art, Kibbutz Ein Harod. Shabbetai Levy Day-Care Center, Haifa. Whos Who of American Women. William Wolf, A Career is Shaped. Annual Exhibitions, American Society of Contemporary Artists, Lever House, New York. 13 Artists from Ein Hod, Artist House, Tel Aviv.